Thorne offers birthday parties at the Sombrero Marsh Environmental Education Center for youth ages 3-10. Birthday parties include two hours of hands-on activities and nature exploration led by one of Thorne’s experienced environmental educators, with an additional 30 minutes to enjoy cake and refreshments. We promise a fun and educational birthday party that your son or daughter will remember for years to come! Please read the FAQ’s provided below to learn all you need to know about Thorne Birthday Parties. CLICK HERE to see available dates, make your party reservation, and pay for your party. Contact Gwen Tenney at gwen@nullthornenature.org or 303.499-3647 ext 103 with questions if you can’t find the answer below or to book a party for more than 12 children. We know that parents need answers to lots of questions before they decide where to have their child’s birthday party. We have compiled answers to a list of the most popular questions parents ask Thorne about hosting birthday parties and encourage you to e-mail gwen@nullthornenature.org or call 303.499.3647 x 103 if you would like to speak directly about any questions you have about birthday parties at Thorne. What will children do during a Thorne birthday party? Birthday Parties include two hours of hands-on activities and nature exploration led by one of Thorne’s experienced environmental educators, with an additional 30 minutes to enjoy cake and refreshments at our beautiful site. The general flow of the program is to begin with a lesson indoors about the many living things that call Sombrero Marsh home. Typically we dress the birthday child up like an insect, something each participant is sure to find while exploring outside, and educate everyone about insect body parts. Next, we set kids loose on our trails armed with nets, trays and magnifying glasses, field guides, and binoculars and then provide hands-on and fun learning experiences tailored to whatever they see, hear, and catch. If the children are completely engaged in exploring, we will spend the bulk of the time outside and return indoors in time for cake and refreshments. If you have special activity requests, you can let us know and we’ll see if we can accommodate your birthday wishes. Here’s the typical schedule for a Birthday Party. Where will the birthday party be held? Thorne’s birthday parties are held at the Sombrero Marsh Environmental Education Center in Boulder (1466 63rd St. Boulder, CO 80303). Thorne has indoor and outdoor play/learning spaces including interactive exhibits, a trail system with boardwalks, and 45 acres of open space including both prairie and wetlands. CLICK HERE to view a map to our facility. You may drop in to check out the space during Thorne Open Hours every Monday and Tuesday from 1-5pm. When does Thorne offer birthday parties? Thorne schedules birthday parties on most Saturdays throughout the year, excluding holidays. We have two time slots each Saturday – one from 10am-12:30pm and another from 1:30pm-4:00pm. We ask that you schedule your birthday party at least 20 days before your desired date. If you wish to schedule a birthday party at a different time of year, day, or time please contact us and we will try our best to accommodate your needs. CLICK HERE to see available times for Thorne Birthday Parties. What is the cost of a Thorne birthday party? The cost of a Thorne birthday party is $250 for 1 to 12 children and $400 for 12 to 24 children. When there are more than 12 children, Thorne will provide a second educator. Scheduling large parties is dependent on staff availability and cannot be guaranteed. What ages does Thorne accommodate for birthday parties? Thorne can arrange fun and educational birthday parties for youth ages 3-10. How long are Thorne’s birthday parties? Thorne’s birthday parties are 2 ½ hours in length which includes two hours of hands-on activities and nature exploration led by one of Thorne’s experienced environmental educators, with an additional 30 minutes to enjoy cake and refreshments at our beautiful site. Please let us know if you need more than 30 minutes because you are serving a full meal, and we can shorten the program time. When can I get access to Sombrero Marsh to prepare for the party? The Center will be open 15 minutes before and after the party for you to set up and clean up. It is important that you stay within this allotted time, as we may have another party scheduled the same day. What equipment is available for use for a birthday party? What do I need to bring? Thorne provides tables and chairs for your use – we have 5 tables that are 6’ (72”) and one that is 8’ (96”) as well as 30 chairs. Thorne also has a refrigerator, freezer, and power outlets. You can also leave your garbage, recycling, and compost with us after the party. We do ask that you bring your own cake, refreshments, table cloths, decorations, dinnerware, and party supplies if desired. CLICK HERE for more information about the Sombrero Marsh Environmental Education Center and to see indoor and outdoor photos of the Sombrero Marsh site. Do I need to stay during the party or can I drop off my child/ren? Can families bring younger siblings? We ask that the hosting parents stay at the Center during the birthday party, and welcome all families involved to participate. Younger siblings are also welcome, but we ask that parents supervise any children who are not part of the program. What paperwork do parents need to do? We ask that all birthday party attendees sign a Release and Indemnity Agreement. If parents will not be attending the party with their children, please ask them to send a signed copy of the Release and Indemnity Agreement with their child. Copies of the Release and Indemnity Agreement will also be available on the day of the party. Will Thorne staff take photos? Thorne staff might take photos during the birthday party. Photos help us advertise our programs so we can reach more children through our work connecting kids to nature as a non-profit organization. Please tell the instructor if anyone attending the party is not ok with having their picture taken. We’d also really appreciate you tagging Thorne Nature Experience in any party photos you post on Facebook, Instagram or Twitter! What happens if there is rain or snowy weather? At Thorne we believe that there are always things to do in nature, whatever the weather! If it happens to be a rainy day, a birthday party group might be watching birds inside of our outdoor bird blind, or venturing outside to see what types of animals live in the water and prefer wet habitats. A snowy day might find us following animal tracks in the snow and marveling at the shape of falling snowflakes. Party activities can also be adjusted towards spending a bit more time playing games and doing crafts inside, by participant request. It’s true that weather and seasons do sometimes impact birthday party celebrations, and we’ll always do our best to get the group outside and exploring at the level of their comfort and preparedness. Our professional educators are able to adjust party activities as needed to keep the party fun and exciting for your group whatever the weather! Birthday parties are capped at twelve children because Thorne has found that twelve is the ideal number of children for one instructor to lead as a group and still deliver personalized attention to each child. If you are considering growing your party beyond twelve participants, please be in communication with Thorne staff as soon as possible to see if a second instructor might be available. Plans to add a second instructor and grow party attendees past twelve children must be made at least two weeks in advance of the party date and cannot always be accommodated. Check to see if your preferred time is available HERE. 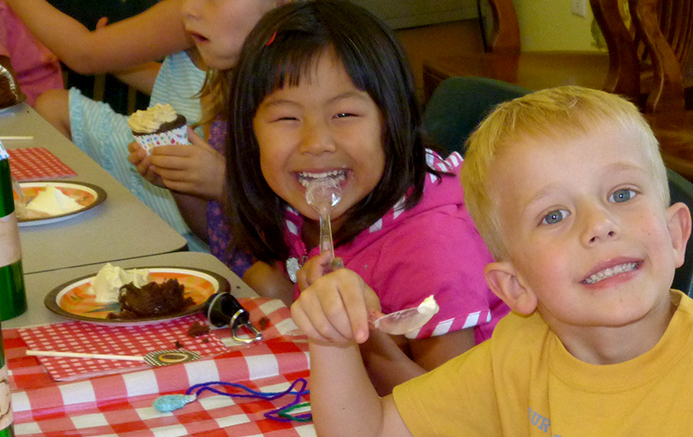 To schedule a birthday party, please contact Gwen Tenney at gwen@nullthornenature.org or 303.499-3647 ext 103. In order to confirm your reservation, you will need to provide payment in full. Call 303-499-3647 ext. 100 to pay for a party over the phone, or mail a check to Thorne Nature Experience, PO Box 19107, Boulder, CO 80308. Reservations must be made at least 20 days prior to the requested date. Rescheduling – To move your party to a new date, please e-mail gwen@nullthornenature.org. Prior to 14 days before a party: A party can be rescheduled to another available date for a $10 fee. Within 14 days of a party: Transfers will not be made; refer to the cancellation policy. Cancellation – If you must cancel, please e-mail gwen@nullthornenature.org as soon as possible. Prior to 30 days before a party: A party will be fully refunded, less a $45 administrative fee. Within 30 days of a party: Refunds will not be given. Last-Minute Medical Transfer/Credit – In the event of illness or injury prior to a scheduled party, please e-mail gwen@nullthornenature.org as soon as possible. Thorne will reschedule the party to another available date or issue a credit good for up to 1 year for a future party for the same child for a $45 administrative fee. A doctor’s note stating the child’s inability to participate will be required. Requests for a medical cancellation will not be granted after the party date has passed.